I recently got a netbook computer for free, with the catch being that it didn't come with a hard drive. Otherwise, it's an OK computer. The left click was pretty much ruined, so I removed the plastic cover, and am now pushing the button mechanism directly with my finger. The second free thing I obtained was a 2Gb cool green USB stick. This was the first time I tried to set up a USB-based OS and it worked like a charm. I knew that given the coolness factor of the project, Linux developers would probably think of being able to install on an USB before Windows developers! I'm not saying Windows isn't cool, but Linux is THIS type of cool. 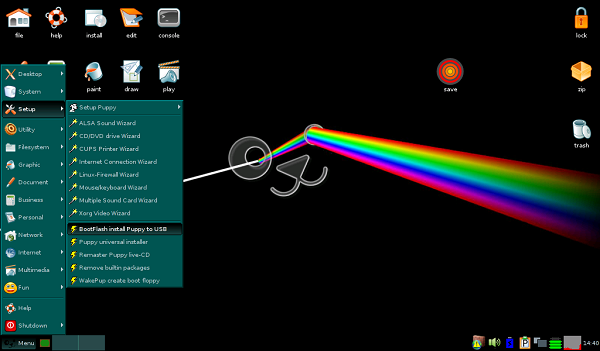 I used Puppy Linux codenamed Slacko 5.3 MAIN. If you wish to get it for yourself, look for a file named slacko-5.3-MAIN2.iso. They have multiple install types of each version, so make sure to go with a MAIN one. It's quite small in size, at 140Mb. Next thing I did once I had the ISO was to burn it to a CD. 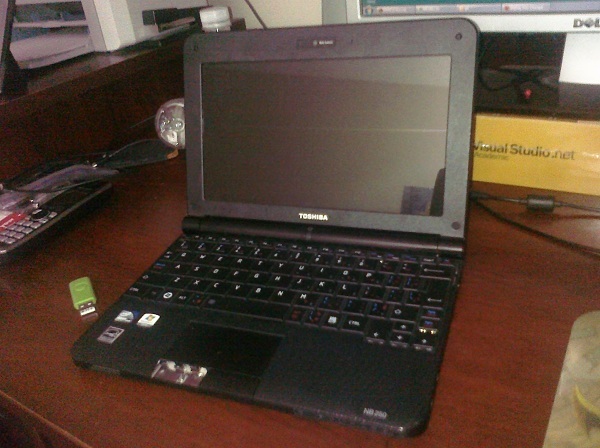 The netbook didn't have a CD drive, so I used a second computer. I booted the Puppy CD, and the OS loaded without a hitch. Fortunately, it had the tools needed to create the bootable USB. Once this was done, the CD could be discarded, as the USB stick contained everything needed to operate the computer! Try to install PET packages only, if you can find versions of them. They are extremely simple to install (click to install in Iceweasel browser). That's about it. It was a fun project, which I've kept around to sometimes play older games. There's a nice emulator suite for Puppy, which is called Puppy Arcade. 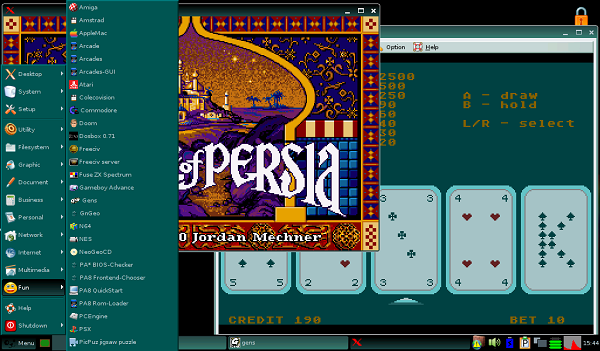 Here's a screenshot of Dosbox running Prince of Persia, alongside Gens running my Genesis video poker game Genpoker.